Two Infants – NAL Co. - Circa 1903. Gray metal with vertigris bronze finish. Measures 5” high x 5”wide x 4-1/4” deep. Weighs 6 lbs. the pair. Inscribed on back NAL Co. diamond shopmark. 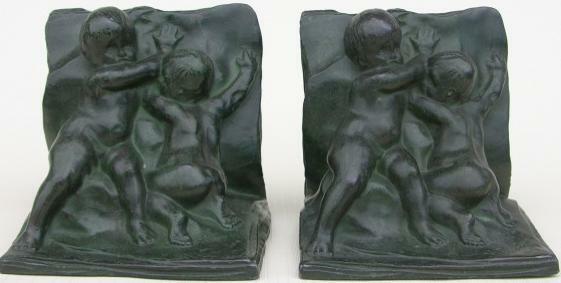 Signed and dated on front: H. Crenier 1903. 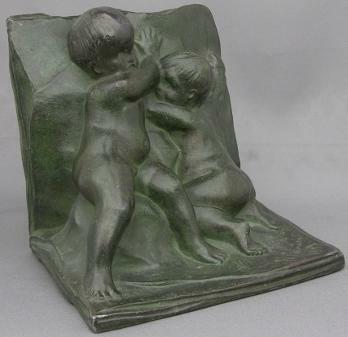 The original sculpture of two infants holding open the pages of a book by Henri Crenier was a popular bookend subject with many manufacturers. This is the oldest example, signed and dated, and featured in Victorian Homes Magazine in February 2004. Felt on bottom missing. Otherwise outstanding condition with wonderful patina.